A late addition from the NHL could pay dividends for Canada’s World Junior team. 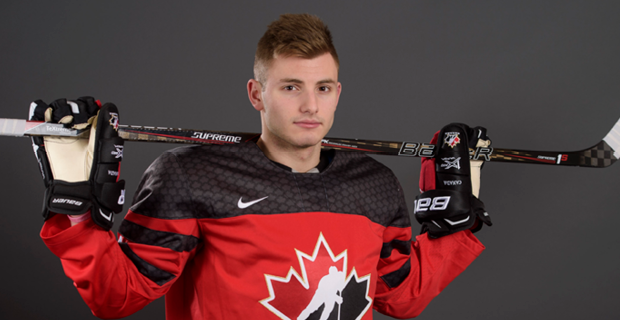 Victor Mete, a London Knights product who earned a spot with the Montreal Canadiens as a 19-year-old, has been loaned to Team Canada in the hopes of pushing them to gold. The defenceman was invited to Hockey Canada’s final selection last year, but didn’t make the cut. Highly regarded for his speed and offensive instincts, Mete was drafted in the fourth round by the Canadiens in the 2016 NHL Draft after helping the Knights win the Memorial Cup. While it’s mostly first or second-round picks who stick in the NHL before they hit 20, Mete proved to be an exception to the rule and impressed the Canadiens brass during training camp. He has played 27 games with Montreal and played part of the season on the same line as star defenceman Shea Weber. Mete has yet to score his first NHL goal, but has earned on average nearly 15 minutes per game and has collected four assists to go along with a plus-5 differential. The Canadiens hope going to Buffalo to face off against the best in the world in his age group will benefit their rising young defenceman. He’ll join a Canadian team that’s sure to have plenty of elite talent from the OHL, starting most notably with returning forwards Taylor Raddysh and Michael McLeod. Erie entered the season as OHL champions and made history last season with its fourth straight 50-win season. Raddysh, part of three 50-win seasons, is one of the last core players around from that era and while the Otters are struggling this year after losing Dylan Strome and Alex DeBrincat among others, Raddysh is among the OHL’s top 10 scorers so far with 44 points (15 goals and 29 assists) in 30 games after finishing second in league scoring last year behind DeBrincat. His presence on Team Canada last year was much appreciated as he filled in a power forward’s role while also contributing six points, including five goals (four of them in one game). There’s no reason why he shouldn’t be able to add to those impressive totals. For his part, McLeod had no problem being pigeonholed into the 13th forward spot last year, but he’ll undoubtedly be looking for more responsibility this time around. This year, the Steelheads captain earned an extended stay with the Devils to start the season, but it was on unfortunate terms as he hurt his knee in his third pre-season game and ultimately required surgery to repair a torn meniscus. Still, he plays the game with arguably more speed and intensity than any player in the OHL. Despite seeing limited action with the Canadians last year, McLeod still made the most of his ice time with two goals and an assist through seven games. Some newcomers from Ontario could step up to play big roles right away as well, starting with Sarnia's Jordan Kyrou. The forward showed signs of becoming a complete player last year and he’s rocketed up the OHL leaderboard this year with a league-leading 58 points (19 goals and 39 assists) through 30 games. Kyrou had to work for a roster spot just like anyone else, but another thing he had going in his favour was the impression he left during the World Junior Summer Showcase, in which he was one of Canada’s best players with five points, including four goals in three games. He brings some versatility in his ability to play both centre and on the wing and is very dangerous in transition, all of which should make him a top-nine forward at least for the Canadians.